OCTOBER 2018 • LONGISLANDPRESS.COM 65 INSIDE JOB INSPIRATIONAL KITCHEN RENOVATION DESIGNS CONTEMPORARY STYLE Impressed with the kitchen reno by Friedberg’s company, Marlene Interiors & Design, the neighbors decided not to wait and moved forward on their dream kitchen design that went from tired and traditional to a more up-to-the-minute contemporary style that suited their active lifestyle. The new design moved away from the dark colors, heavy wood, and trims and columns left by the previous owner that the couple described as “obtrusive” since it blocked their view. Friedberg and her team brought their kitchen into the 21st century with a sleek, streamlined design that features minimalist cabinetry, neutral color palettes, metallic accents, and an open floor plan that highlights this light-filled space as the elegant kitchen they had always envisioned. 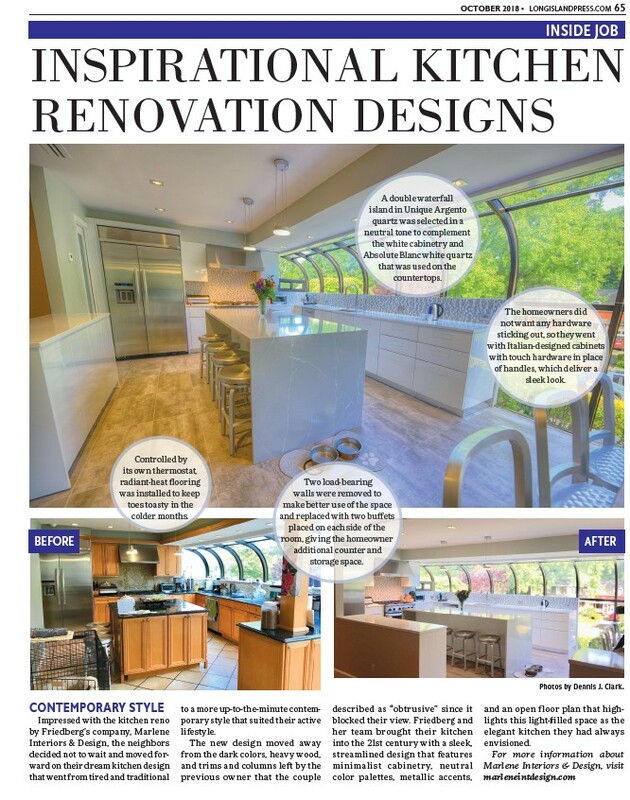 For more information about Marlene Interiors & Design, visit marleneintdesign.com Two load-bearing walls were removed to make better use of the space and replaced with two buffets placed on each side of the room, giving the homeowner additional counter and storage space. Controlled by its own thermostat, radiant-heat flooring was installed to keep toes toasty in the colder months. A double waterfall island in Unique Argento quartz was selected in a neutral tone to complement the white cabinetry and Absolute Blanc white quartz that was used on the countertops. The homeowners did not want any hardware sticking out, so they went with Italian-designed cabinets with touch hardware in place of handles, which deliver a sleek look. BEFORE AFTER Photos by Dennis J. Clark.